What are the games and players to watch in the Championship this coming weekend? After New Mexico United kicked off Week 3 with a historic 2-1 victory over Tulsa Roughnecks FC in the Championship’s Game of the Week on Wednesday night, we can now look ahead to this weekend’s action that will see 14 more matches take place over the span of two days. Saturday’s 11-game slate will begin with a marquee matchup between two unbeaten Eastern Conference sides when the Tampa Bay Rowdies visit Saint Louis FC (2 p.m. ET | Matchcenter | ESPN+). The weekend will wrap up on Sunday night when Memphis 901 FC looks to pick up its first win in club history against Bethlehem Steel FC at Talen Energy Stadium (6 p.m. ET | Matchcenter | ESPN+). The opening game of the weekend may be the biggest one as Saint Louis FC plays host to the Tampa Bay Rowdies. Something will have to give when the two sides meet, as both enter the match with two wins out of two after seeing off quality opposition. STLFC, which took the top spot in the Championship Power Rankings on Monday, has overcome Eastern Conference preseason favorites Nashville SC and Indy Eleven, while Tampa Bay earned back-to-back shutout victories over Memphis 901 FC and Pittsburgh Riverhounds SC. With both defenses having found their stride early this season, expect a close contest that won’t lack in physicality. 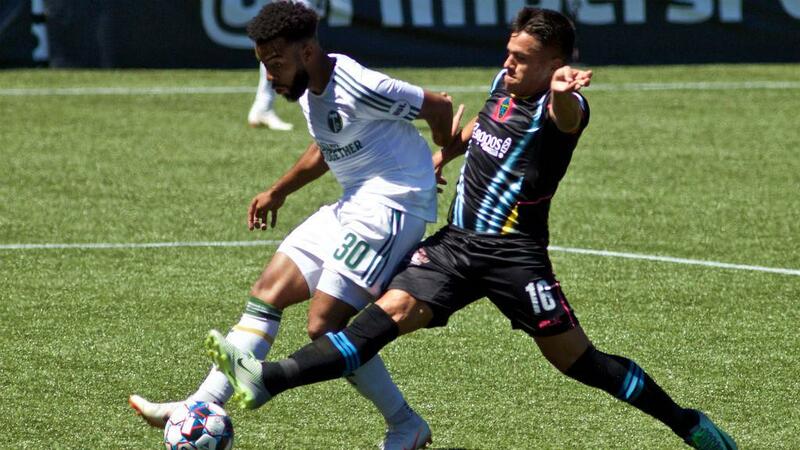 The Portland Timbers 2 picked up their first win of the season last weekend in San Antonio and will look to keep Las Vegas Lights FC from replicating that feat at Merlo Field on Saturday night. Portland got a pair of goals from Marvin Loria in an impressive 3-1 victory, which saw the side bounce back after an opening-weekend draw in Tulsa. Meanwhile, Lights FC Head Coach Eric Wynalda is still looking for his first win in charge of Las Vegas after suffering a 2-1 defeat at OKC Energy FC last weekend. He famously led a side to victory in Portland in the 2012 Lamar Hunt U.S. Open Cup. Could this Saturday mark a repeat performance and kickstart Lights FC’s season? 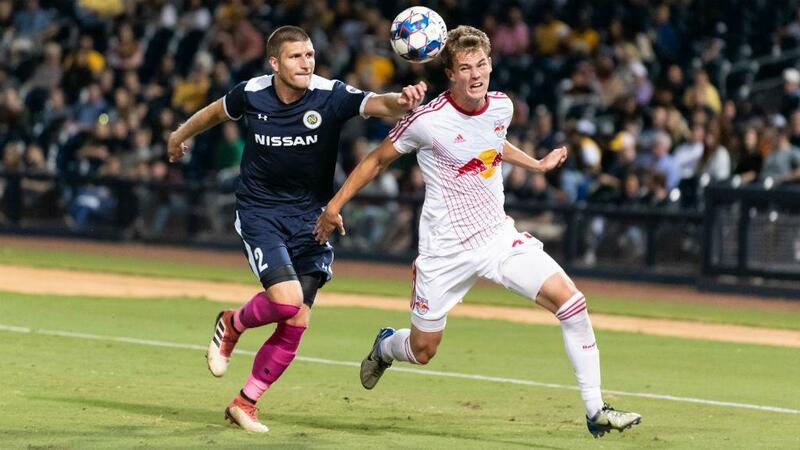 Sunday’s three-game slate kicks off with a clash of Eastern Conference contenders and soccer ideologies as the offensive-minded New York Red Bulls II host defensively stout Nashville SC. New York will hope to pick up right where it left off before its bye week, having recorded 15 shots on target and held the Swope Park Rangers to just one in a 3-1 victory. Meanwhile, Nashville will try to get its new-look attack back on track after falling 1-0 at home to Saint Louis FC. The Red Bulls II will look to push the tempo and take it to Nashville, which will also leave them vulnerable on the counter to the likes of Kharlton Belmar, Cameron Lancaster and Daniel Rios. There should be goals, and lots of them. OKC Energy FC will look to continue its 100 percent start to the season when it visits Sacramento Republic FC at Papa Murphy’s Park. Energy FC forward Deshorn Brown has carried his sensational preseason form into the 2019 campaign, netting three goals in two games to put the Jamaican in a tie for the league lead. Adding to that tally won’t come easy against Republic FC, though. Just ask Colorado Springs Switchbacks FC’s Shane Malcolm, who was limited to a single shot on target in Sacramento’s 1-0 victory last weekend after netting a hat trick at the LA Galaxy II on the opening weekend. We’ve only seen 20 minutes of Dominic Oduro so far this season, but what wasn’t to like? The pizza-loving striker found the back of the net three minutes into his debut for the Charlotte Independence and almost led an improbably fightback for a draw against Indy Eleven last Friday night. I’d like to see Head Coach Jim McGuinness give him a start after a lively performance off the bench, but even in a limited role Oduro has the pace to trouble the opposition’s defense. After spending the 2018 season in Europe, Arun Basuljevic has made an impressive return to life in the USL Championship. The 23-year-old, who featured on loan for the New York Red Bulls II in 2017, completed just over 91 percent of his passes and scored two goals last weekend to lead Fresno FC to its first win of the season. Having already matched his 2017 goal total with the Red Bulls II, Basuljevic will look to exceed it when the Foxes host Reno 1868 FC on Saturday. When Louisville City FC needed a moment of quality against ATL UTD 2 last Friday, it was Brian Ownby that provided it as he picked out Abdou Mbacke Thiam with an inch-perfect cross for the game-winning goal. Ownby and Louisville have yet to really get into top gear so far this season but that could change this weekend when they host their opener against Hartford Athletic at Slugger Field. The Athletic have conceded two goals in each of their two games so far this season, look for Ownby to help Louisville continue that trend. David Ochoa becomes the first goalkeeper to make the list this season, but the 18-year-old has certainly earned that recognition after an impressive first two weeks of the season for Real Monarchs SLC. The United States U-20 international recorded a nine-save shutout last weekend against El Paso Locomotive FC and leads the league with 13 saves in all, having conceded just one goal. Ochoa’s performance after the Monarchs were reduced to 10 men last week helped his side earn a point and he will be hoping to slow down Augustine Williams and the LA Galaxy II attack on Saturday to get his side in the win column. - New Mexico United’s first victory in club history on Wednesday night against Tulsa Roughnecks FC was also the first by an expansion side this season. The league’s seven new teams now have a combined record of 1-8-6. - Some squads across the Championship will be a little short-handed this weekend as 39 players have been called up to represent their country over this international break.